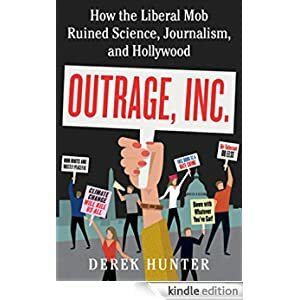 From Derek Hunter—one of the most entertaining political writers today—comes an insightful, alarming look at how progressives have taken over academia, pop culture, and journalism in order to declare everything liberal great, and everything great, liberal. There are three institutions in American life run by gatekeepers who have stopped letting in anyone who questions their liberal script: academia, journalism, and pop culture. They use their cult-like groupthink consensus as “proof” that science, reporting, and entertainment will always back up the Democrats. Clever, controversial, and convincing, Derek Hunter’s book gets to the root of America’s biggest cultural war lies. Buy this book for only $1.99 today. Click here to purchase Outrage, Inc.